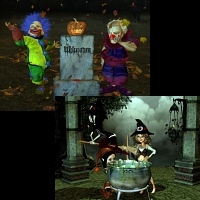 Six 3D fantasy animations of things that occur on All-Hallows-Eve. Ghosts, witches, ghouls, and more. "horror" Music is optional. Happy Halloween! This saver shows all 6 animations in sequence. Download All-Hallows-Eve animated Wallpapers and still Halloween wallpapers here! Images and Screensaver copyright, ART-TLC ©.